DR W-Bar-3ft Long. 1/2" x 3/8" x 3/8". Clear extruded High impact acrylic "W" shape can be used to adapt products for slatwall display. The horizontal gluing surface makes for strong adhesion. DR W-Bar-6ft Long. 1/2" x 3/8" x 3/8". Clear extruded High impact acrylic "W" shape can be used to adapt products for slatwall display. The horizontal gluing surface makes for strong adhesion. Oversized package fees apply. DR Z-Bar-3ft Long. 1/2" x 5/8" x 1/2. Clear extruded High-impact acrylic. This is very popular acrylic extrusion for creating slatwall products.Slide end of Z-Bar into slatwall. Vertical gluing surface. DR Z-Bar-6ft Long. 1/2" x 5/8" x 1/2. Clear extruded high impact acrylic. This is very popular acrylic extrusion for creating slatwall products.Slide end of Z-Bar into slatwall. Vertical gluing surface. Oversized package fees apply. U-Bar-3ft Long. Clear Extruded acrylic U-shaped bar accomodates any size clip hook. Also, hangs earring cards. 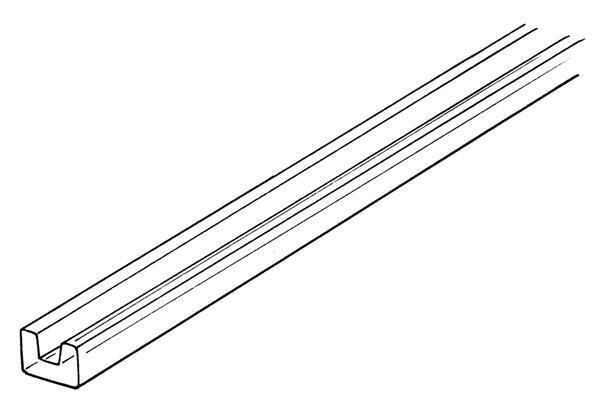 U-Bar-6ft Long-.310"h x .4"w. Clear Extruded acrylic U-shaped bar accomodates any size clip hook. Also, hangs earring cards. Oversized package fees apply. Z-Bar-3ft Long. 1/2" x 5/8" x 1/2. Clear extruded acrylic. This is very popular acrylic extrusion for creating slatwall products.Slide end of Z-Bar into slatwall. Vertical gluing surface. Z-Bar-6ft Long. 1/2" x 5/8" x 1/2. Clear extruded acrylic. This is very popular acrylic extrusion for creating slatwall products.Slide end of Z-Bar into slatwall. Vertical gluing surface. Oversized package fees apply. W-Bar-3ft Long. 1/2" x 3/8" x 3/8". Clear extruded acrylic "W" shape can be used to adapt products for slatwall display. The horizontal gluing surface makes for strong adhesion. W-Bar-6ft Long. 1/2" x 3/8" x 3/8". Clear extruded acrylic "W" shape can be used to adapt products for slatwall display. The horizontal gluing surface makes for strong adhesion. Oversized package fees apply.